How can you bring your brand to ADA signage when creating new signs or bringing your current ones into compliance? While ADA signage requirements are first and foremost intended to improve safety and accessibility for customers and building visitors, many companies are pleasantly surprised at how the required signage can also support branding. We’ve helped large and small companies get a better understanding of ADA signage and to see how they can incorporate it into their interior design and include branding elements. ADA signage is designed in accordance to the regulations of the Americans with Disabilities Act (ADA). These regulations ensure that signs are accessible to every customer through requirements like convenient location and easy readability both visually and through tactile touch. Many people mistakenly think that ADA signage specifically refers to braille on signs that make them accessible to the blind. While braille signage is an important aspect of ADA signage, it isn’t the only regulation. 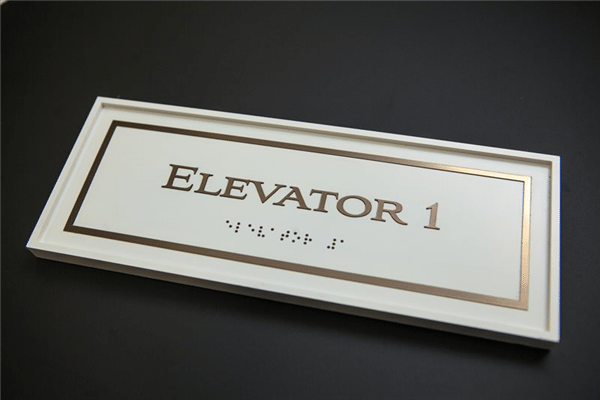 Every sign that is considered an architectural sign that identifies rooms or spaces, directs or informs what the room or space is used for, or lists the accessibility features of a building, including exit signs, must be ADA compliant. Things like having a non-glare background, contrast between characters, an easy to read typeface, and sizing and spacing of the letters are just a few of ADA regulations that companies must be aware of. Just because your building’s ADA signs need to follow a comprehensive set of requirements, doesn’t mean they shouldn’t also reflect well on your brand. These ADA sign examples show you what we mean when we say clear, compliant ADA signage can make a beautiful addition to your building’s interior design. We’ve recently completed a project at The Row in Somerville that included designing ADA signs incorporating the hotel’s brand in both amenity and room signs. The room signs are a laminate wood that matches the wood in the build-out. They are both designed in collaboration with XXS Hotels; a design and brand firm that develops and builds hotels for chains such as Coldwen. 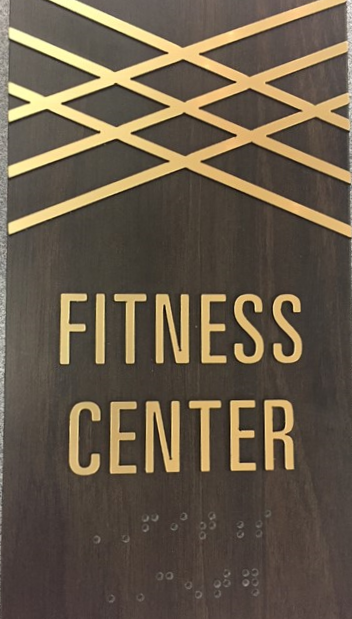 Architectural signage lends itself to appliqué where we are able to layer and play with components that are part of the build out. Clari-T panels, which are created out of a metal fabric, allow us to create both visually appealing and ADA compliant signs. Clari-T is an innovative line of decorative acrylic panels. Made of poured acrylic, the pure transparency of this collection is amazing – good looking and durable while meeting ADA requirements. At Metro Sign and Awning, we take signage and regulations very seriously. Whether working with large corporate headquarters, on public projects, or with small businesses, we have the experience and dedication to get ADA signage right. Our designers and project managers have in-depth understanding of the process and requirements that will be reviewed, and the experience to work with officials to ensure win-win solutions when variances are needed. Some requirements, like the size and placement of stairway signs, are interpreted differently in different municipalities, or based on architectural specifications. Our signage services include design guidance that goes beyond the standard ADA compliance, and project management that ensures your signage package is approved and installed on time. Have questions about how tp make ADA signage work for your building, and your brand? We’d love to hear from you.